AMC’s stylish, wry, blasphemous new series deserves to become as big a hit as The Walking Dead. 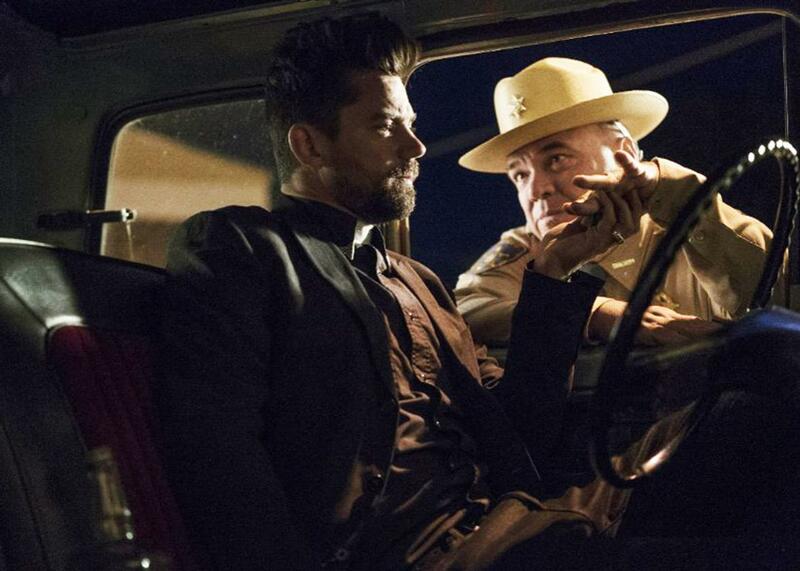 W. Earl Brown and Dominic Cooper in Preacher. AMC has had tremendous earthly success adapting comic books into television shows. The Walking Dead, based on Robert Kirkman’s comic book series, has been dinged by critics but has nonetheless infected the brains of a huge audience; the show has been a massive hit for the network. Two series have been spun off it, the scripted drama Fear the Walking Dead and the post­–Walking Dead debrief, Talking Dead. On Sunday night AMC will debut Preacher, an adaptation of a beloved ’90s comic book written by Garth Ennis and drawn by Steve Dillon, and cross its fingers that vampires, angels, demons, gods, various other supernatural beings, and a character named Arseface—because his face looks like, well, you know—will appeal to as many people as zombies. (The after-show, laughably titled Talking Preacher, is already in place.) As a television critic, I, too, can only wait to see if the stylish, funny, wry, blaspheming Preacher will go over nearly as well as the undead, but I can say now: It deserves to. Cooper is often cast as a voluble, witty smartass with a mischievous streak, the promise of good times and trouble gleaming out of his beautifully lashed eyes. But in the first four episodes of Preacher, the only ones available to critics, Cooper plays Jesse as laconic and low-energy, a mood befitting a man in the midst of a depressive spiritual crisis, going through what amounts to a kind of withdrawal from his addiction to violence. Other characters step in to supply the fizz. Jesse’s ex-girlfriend Tulip (Ruth Negga) is all sugar and spice and nothing nice. She’s a ray of sunshine, if sunshine could kill you very quickly. Charming, impish, and extremely dangerous, she is turning bazooka-making into a kid-friendly activity when we first meet her. Even more antic than Tulip is Cassidy (Joseph Gilgun), a supernatural being with a thick Irish brogue and not an ounce of body fat who spends his immortality getting drunk and high on whatever is closest at hand. He and Jesse immediately become good mates, because, though the preacher is going through a mellow spell, he’s drawn to charismatic maniacs. Other cast members include two government officials—who seem to be spiritual kin to the title characters in Men in Black—looking for Jesse and a level-headed single mom who helps Jesse out at the church and wears the most realistic khakis I’ve ever seen on television. (Preacher has a great costume designer. Her other triumphs include Cassidy’s ridiculous outdoor getup and Cooper’s impeccably tailored preacher-by-way-of-a-cowboy all-black duds.) There’s also Arseface (Ian Colletti), a young man whose failed suicide attempt has left him his new nickname; his corrupt sheriff father Hugo Root (W. Earl Brown); and the fantastically named Odin Quincannon (Jackie Earle Haley), a slaughterhouse owner and the most powerful man in Annville. Annville is a small town as specific as Breaking Bad’s Albuquerque, Fargo’s Minnesota, and True Blood’s Bon Temps. It’s dusty, gorgeous, and seedy, guided by rigid and hilarious customs masquerading as neighborliness and populated by oddballs and secret-keepers of both the human and supernatural varieties. It has a bloody history covered over by the thinnest veneer of propriety. The old town mascot, an American Indian, has recently been replaced by a prairie dog, and it leads to fistfights in the streets. Women run through town in their underwear, hunted down, as part of a game. Would-be pedophiles drive the school buses. The first few episodes of Preacher cover superhero story beats that should be as tired as Captain America after fighting his way through 10 movies, always being righteously right. But Preacher tells what amounts to Jesse Custer’s origin story in ways that feel fresh. Jesse doesn’t dominate the show, which is full of all sorts of eerie, macabre, and clever moments, down to its elegant and dry title cards. An aerial shot of an out-of-control car beating an S through a corn field, a Native American couple vacating a house that is immediately bulldozed, a fight scene at 30,000 feet: These are treated with as much care and enthusiasm as Jesse’s maybe-come-to-Jesus. Jesse’s new powers are very similar to those of Kilgrave, the terrifying mind-controlling villain of Netflix’s Jessica Jones. Like Jessica Jones, Preacher gets at issues of consent, if from a far more sacrilegious angle. Preacher doesn’t just wonder what faith is if it’s forced upon you by an awesome and awful power; it wonders if faith isn’t, to some extent, always forced upon you by some awesome and awful power. After all, awesome and awful God—who is a character in the Preacher comic books, but may or may not appear in the series—works in mysterious ways. About Jesse’s spiritual, or perhaps demonic, awakening, Preacher is flashy, funny, searching, and unpretentious. The show is about heady issues—God and power and faith, and how all of these things can come to reside in flawed beings—but it interrogates these issues as if through a fug of the air-conditioner fluid that Cassidy is always looking to huff. Jesse wants to be a good guy, but as Tulip tells him—in a quote most TV shows could stand to tack above their desks—“There are no good guys; there are just guys.” This is what makes Preacher such a heretical superbeing text: Superpowers don’t make the characters in Preacher super; they just heighten their flawed, human selves. If we are really made in God’s image, better take a good look around.